The second American Revolution will be a fire lit from an internal spark. The year is 2022. America is on the verge of economic and social collapse. The government has made individual freedom its enemy. African American hacker Isse Corvus enters a black-ops training camp. He discovers the leaders are revolutionaries seeking to return the U.S. back to its Constitutional roots. Soon the camp fractures. Who is traitor? Who is patriot? Corvus learns that if he doesn’t join The Cause and help them hack the NSA’s servers, it could mean his life. If he joins, he becomes part of a conspiracy to overthrow America’s financial oligarchy. NSA Director Titus Montgomery is building a system to pacify America’s instigators. The President tells him that rule of law must be maintained at all costs. But what happens when martial law meets revolution? 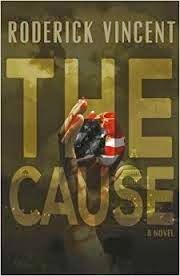 The Cause is a dystopian thriller taking many topical issues to the next logical level. The dense web of the NSA’s previous generation’s surveillance system has been supplanted by a new, more ruthless one. Robotic warfare, drones, quantum computers, Anonymous, the NSA, and a cast of conniving characters, this novel takes you on a manifest journey on how a new revolution could be born.